Hangzhou, the capital city of Zhejiang Province, lies by the Qiantang River and at the southern terminal of the Beijing-Hangzhou Grand Canal. As one of China's seven ancient capitals, it is also a famous historical and cultural city and a major tourist center as well. Hangzhou is known throughout the world for its breathtaking scenery around the West Lake. is skirted on three sides by mountains and by water on one side. Two dykes, Bai and Su, divide the hike into five parts. On the lake there are four isles, Gushan (Solitary Hill), Xiaoyinzhou (Small Fairy Isle), the Mid-lake Pavilion and Rangong Mound (named after a provincial governor). The 60-squarekilometre scenic zone around the West Lake is strewn with more than 40 major scenic sites and 30 or so sites of cultural interest. The blue smudge of mountains that surrounds the lake lies under a cover of luxuriant trees and flowers. Peaks, rocks, caves and ravines each hold forth the fascination of a unique scenery that compares favorably with the wonderland thanks to the addition of so many pavilions. kiosks, pagodas, stone caves, springs, ponds and running streams. Visitors keep coming in droves from around the world to marvel at the much-vaunted ten major scenes and sights of the West Lake with exotic names: "Spring Descending on the So Dyke", "Lotus Flowers Swaying in Gentle Breeze in the Quyuan Garden", "Autumn Moon on the Calm Lake", "Snow on the Broken Bridge", "Orioles Singing in the Willows, Viewing Fish in Huagang Pond", "Leifeng Pagoda in the Twilight of the Setting Sun", "Twin Peaks Soaring into Clouds, Evening Bell Tolling at Nanping", and "Three Pools Mirroring the Moon". The West Lake is, first of all, a well-preserved natural garden. 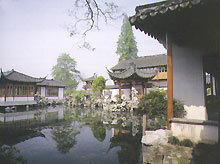 Since ancient times, large numbers of pavilions, terraces, kiosks, and gardens within gardens, have been constructed on the isles and the lakeside. The result has been a string of classical gardens that are picturesquely scattered and integrated with the natural beauty of the lake. The West Lake is quintessential of traditional Chinese garden culture, yet it is also different from any private gardens in the lower Yangtze valley.